New year’s eve is approaching and the vasilopita will become the center of attention at midnight! There is a coin hidden in it, so when it is cut in pieces, the family member who finds the coin he/she supposedly has good luck for the rest of the year! Coin: Take a small coin, wash it, dry it, wrap it in aluminum foil, dip it in flour and put it in the batter. Baking: This cake is a bit moist so the baking might be a bit tricky. Open the oven only after it is ready and dip a wooden skewer – it should come out clean. Preheat oven at 180ºC/fan. Mix flour with almond powder and baking powder. In your stand mixer beat oil with sugar for 5-7 minute until fluffy. Add eggs, one at a time, and beat for 3-4 minutes. Add all citrus zest and juice alternating with flour mix, until you get a smooth batter. Butter a round spring form 23-24 cm. Transfer batter in the spring form, add a small coin wrapped in aluminum foil, and bake at 175ºC/fan for 40-50 minutes. Cool in the tin and then on a wire rack until it cools completely! Glaze: Melt butter in a small pan with heavy bottom. When it starts bubbling lower down heat. When it starts changing color and is turning to light brown, set aside to cool. Mix milk and icing sugar and stir in butter, along with a few drops lemon juice. Transfer the vasilopita on a serving platter and drizzle with the glaze. 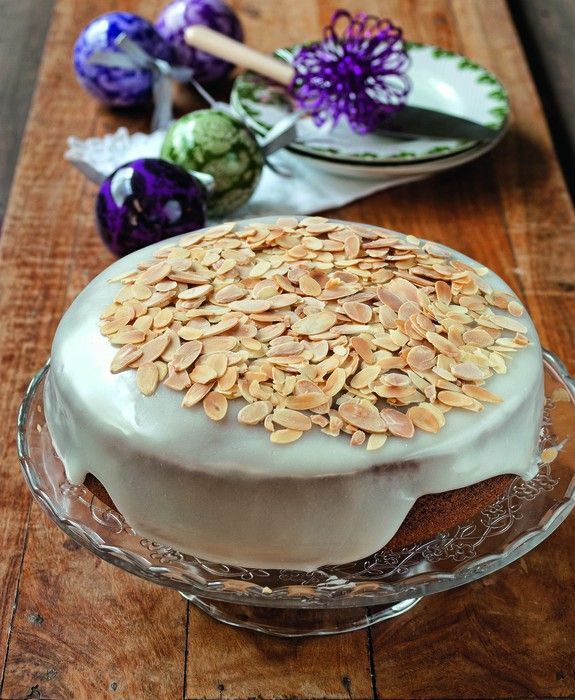 Sprinkle with almond slices and set aside until cut at midnight and… Happy New Year!! !